The leaves in this booklet are worked for ten hours in five phases to transform them from a silver ingot form to leaves tenths of microns thick. 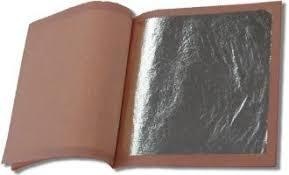 This leaf booklet contains 25 silver leaves measuring 80x80mm. One book of silver will cover an area of 0.16m² without waste or overlap. (The amount of waste can be determined by the gilder’s own level of expertise and will depend on the complexity of the surface being gilded.) The higher the silver content of a leaf the more durable it will be. For outdoor work it is advisable to only gild using leaf that 23ct or higher to avoid tarnishing.